Firefighting foam seen downstream of the Silver Stream Diversion on April 14, 2019. Photo provided to Riverkeeper. A spill of firefighting foam from Atlantic Aviation at Stewart International Airport has visibly affected nearly two miles of the Silver Stream, according to photos sent to Riverkeeper and information provided by the Department of Environmental Conservation. Based on information provided to DEC, the foam discharge likely occurred at Atlantic Aviation sometime on the morning of Saturday, April 13. The foam traveled through airport drainage to a tributary of Silver Stream. 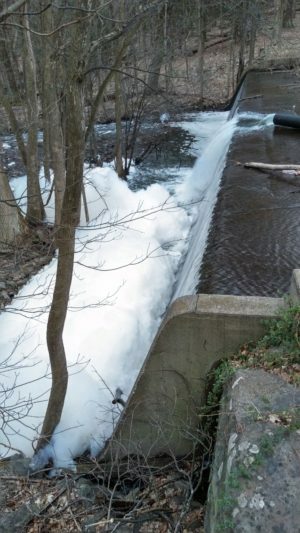 As of sunset on Sunday, April 14, foam was visible as far downstream as the Silver Stream diversion near the intersection of Routes 207 and 300 in the Town of New Windsor, according to photos provided to Riverkeeper. 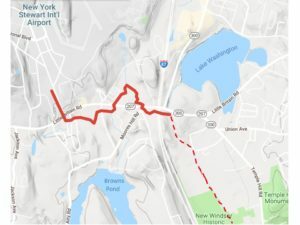 For decades the Silver Stream diversion has marked the point where water from Silver Stream is diverted to fill Washington Lake, one of the City of Newburgh’s reservoirs. The diversion has not been operational since May 2016, when the City declared an emergency over contamination by toxic PFAS chemicals associated with firefighting foam, which was traced to Stewart Air National Guard Base. The Air National Guard Base is adjacent to Stewart International Airport. The approximate extent of firefighting foam pollution observed in Silver Stream and one if its tributaries is shown by the solid red line. The path of Silver stream downstream from that point is marked with a red dashed line. Washington Lake was not affected by the April 13 spill. The City’s current water supply is Browns Pond, which is unaffected by airport or Air National Guard Base runoff. “The City’s drinking water does not come from the contaminated area and remains safe for consumption,” City Manager Joseph Donat said in a press release. 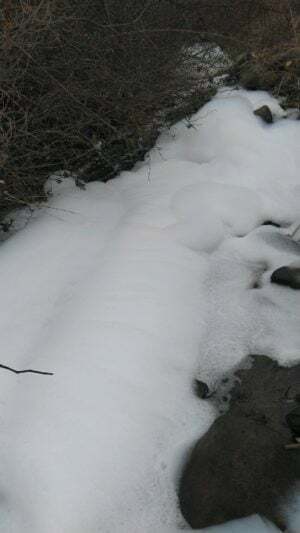 Foam seen on April 14, 2019, in a tributary that connects part of Stewart International Airport to Silver Stream. Photo provided to Riverkeeper. Silver Stream flows to Moodna Creek and the Hudson River. 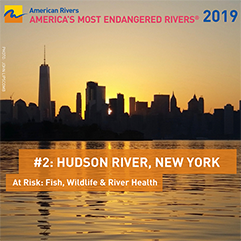 The New York State Department of Health advises anglers to catch and release all fish caught from Silver Stream and portions of Moodna Creek, due to the risk of exposure to PFAS that could come from consuming fish. Moodna Creek was to have been stocked with trout by DEC this Spring. DEC has overseen the response to the April 13 spill, which so far includes containment booms in Silver Stream meant to stop the flow of floating foam downstream, and the use of vacuum trucks to remove and store the foam until it can be disposed of. The firefighting foam released April 13, according to information provided to DEC, does not contain PFOS or PFOA, the two most well known toxic members of the PFAS family of chemicals. The foam is likely to contain other PFAS chemicals that are unregulated. These chemicals are highly soluble in water and could be present even where foam is not visible.